Compatibility testing between ForeFlight and iOS 12.2 is complete and we are issuing the “all-clear” to ForeFlight customers. Feel free to update at your convenience. Follow our Facebook page or Twitter feed for announcements regarding future updates. We also finished testing ForeFlight on Apple’s new iPad Mini 5, which looks and performs excellently thanks to its new Retina display with True Tone and A12 Bionic chip. ForeFlight is thrilled to announce that we are now part of the Boeing family. For more information, please visit http://www.foreflightaboeingcompany.com. CHICAGO, March 6, 2019 /PRNewswire/ — Boeing [NYSE: BA] completed the acquisition of ForeFlight, a leading provider of innovative mobile and web-based aviation applications. ForeFlight 11.1 includes a bevy of flight planning improvements for every stage in the preflight process, an option to create new draft Logbook entries from filed flight plans, new flight plan options for military pilots, and more. These flight planning enhancements help you plan smarter and more efficiently by making helpful information and actions easier to access. For example, when you create a new flight plan on the Flights view and add the departure and destination airports, if the default cruise altitude for the selected aircraft is too high for that route then ForeFlight will automatically suggest a lower altitude. Just tap “Update” in the popup to accept the change and use the new altitude. If you’re researching FBOs for your flight, you’ll notice three new buttons near the top of the FBO detail view. In order, these allow you to call the FBO, locate the FBO on the Apple Maps app, and email the FBO’s primary email address. You might recognize these buttons from somewhere else if you frequently plan with the Flights view – they appear under Destination Services near the bottom of the planning form any time you select an FBO for the flight. Moving on to the Flights view filing form, you can now select Mach and KPH for the airspeed units, making it easier to file for jet pilots or those who fly in countries that use kilometers per hour as the standard airspeed units instead of knots. Once you file your flight plan, ForeFlight makes it easier to differentiate between the route you filed with, the expected route, and the currently-planned route (when different) by displaying each of these routes in their own fields on the planning form. Tap the “Use” button next to either of those fields to adopt that route as the planned route – this makes it easy to amend your flight plan using the expected route to increase the likelihood that ATC will clear you as filed. Once you re-file the plan using that route, the main route field says “Route (Filed & Expected)”, providing a quick confirmation that the route you filed is also the expected route. On the topic of “cleared as filed” flight plans, you can expect to see more of those when filing with our Recommended Route thanks to a number of tweaks to our routing logic, including the incorporation of recently-cleared routes that differ from the normally preferred route due to weather or other factors. The Recommended Route is one of the great value-adding features of our top tier Performance plans, and you can learn more about how it works here. Lastly, you can now quickly remove a waypoint or airport from your route by tapping it on the Maps view and tapping “Remove from Route” at the top of the popup. ForeFlight can now automatically create new draft Logbook entries when you file flight plans, giving you a head start on logging the flight. Draft entries from filed flight plans include the departure and destination airports, filed route, date and time, aircraft, total time based on expected ETE, and one takeoff and full stop landing. Easily modify or add information to the draft entry before approving it and adding it to your logbook. If you amend or cancel the flight plan after filing it, the draft logbook entry will reflect the changes, whether by updating its information based on the amendments or being deleted when you cancel the flight plan. You can enable the new setting in Logbook > Settings > Draft Entry Creation, where you can also enable or disable draft entries from recorded Track Logs – we recommend you only enable one at a time to avoid duplicated entries. Military and government pilots flying with ForeFlight’s Military Flight Bag app can now file flight plans using the official DD-1801 filing form directly through ForeFlight, greatly simplifying their preflight workflow and reducing reliance on paper. DoD regulations often require that all pilots departing from a military field fill out and sign a DD-1801 flight plan form and submit it to base operations by hand, fax, or email. To simplify this process, ForeFlight will automatically generate a DD-1801 PDF with your flight’s details, then allow you to digitally sign it and send it via email to base ops. Watch the video above to see the whole process in action. Continuing the trend of the past 6+ months, this release includes new charts and data for the United Kingdom, Ireland, and Norway, plus optional VFR add-ons for each. For the U.K., access IFR procedure charts, airport diagrams, and documents via EUROCONTROL, all of which are available once you update to 11.1. New optional add-ons include the NATS VFR ICAO Chart (1:500k) and the Pooleys VFR Trip Kit, joining Jeppesen’s VFR procedure charts (formerly known as “Bottlang”) that were already available for the U.K. 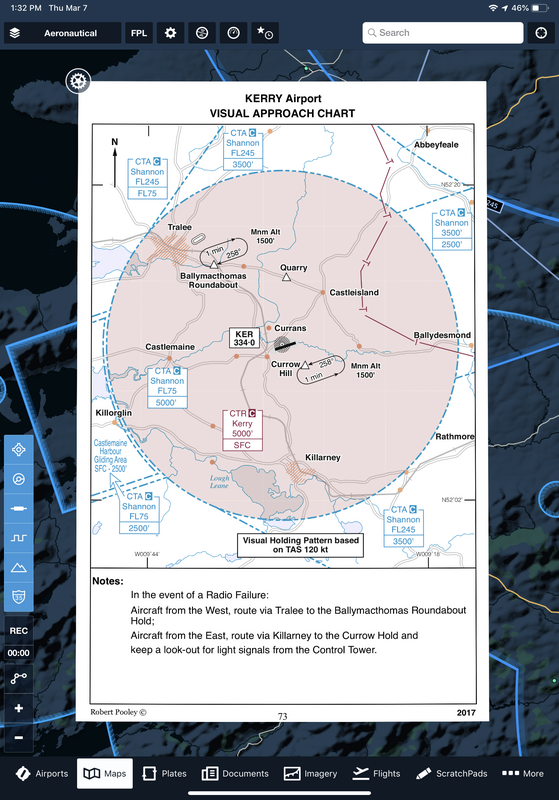 Included for Ireland are IFR and VFR procedures, airports diagrams, and documents via EUROCONTROL, plus the option to add Ireland’s Pooleys VFR Trip Kit or Jeppesen VFR procedure chars. Finally, pilots flying in Norway can download and view IFR High and Low enroute charts on the Maps view, IFR and VFR procedures, airport diagrams, and documents via EUROCONTROL. 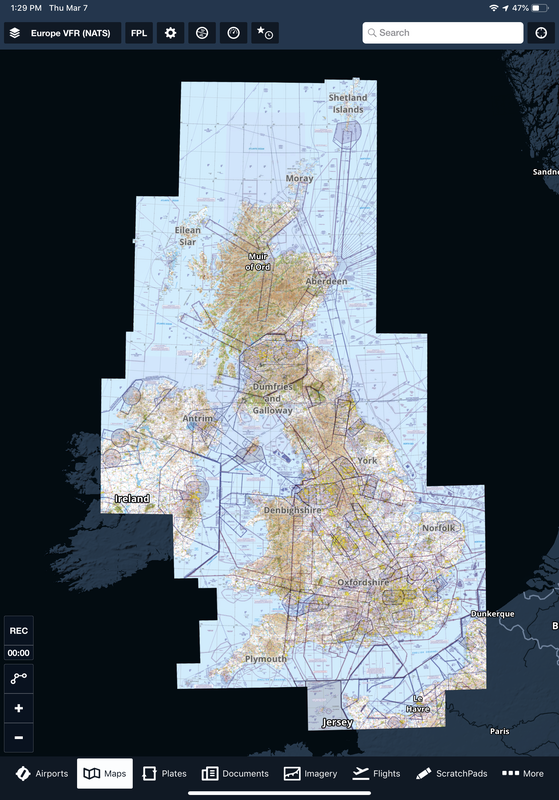 The Avinor VFR ICAO Chart is available as an add-on along with Jeppesen’s VFR procedure charts. Visit foreflight.com/europe to learn more about what features and data European pilots can benefit from. Compatibility testing between ForeFlight and iOS 12.1.4 is complete and we are issuing the “all-clear” to ForeFlight customers. Feel free to update at your convenience. Follow our Facebook page or Twitter feed for announcements regarding future updates. ForeFlight 11 is available now and features an immersive Airport 3D View to help you get familiar with new airports , inflight tracking with Breadcrumbs, Graphical AIRMETs via ADS-B, and more! This 3-dimensional preview of the airport environment combines terrain data and aerial imagery to help you get familiar with new airports, whether you’re preparing for your next flight or exploring new places to fly. This feature is available with Performance Plus and Business Performance subscription plans. You can access any airport’s 3D View by tapping the “3D View” button on Airports or in the airport popup on Maps. ForeFlight combines high-resolution terrain and streamed aerial imagery to create a realistic representation of the airport environment. Rotate and zoom the camera in or out to access every perspective, and watch the metrics in the top-left of the view update as you move the camera. Tap the runway button in the top-right to position the camera along the published glideslope for that runway, or at an angle of 6° if the runway doesn’t have any published approaches. Check the compass and airport diagram in the bottom-left of the view to see the wind direction relative to the selected runway. Breadcrumbs are an extension of ForeFlight’s Track Log capability allowing you to see the track log as it’s recorded, leaving a continuous line that you can reference for maneuvers, Search and Rescue and survey work, or just to see where you’ve been. At any time during or up to 30 minutes after the flight you can tap on the breadcrumb trail to see information about it, including the total recorded time, the distance traveled, and your average ground speed. Being able to see your flight’s path directly on the map can assist with specific tasks, maneuvers, missions, and improve your situational awareness. Breadcrumbs are available with all ForeFlight subscription plans, so give it a try and see how it can help your flying! Connect to an ADS-B In receiver and stay aware of potentially dangerous weather as it develops with the FAA’s new Graphical AIRMETs in ForeFlight. G-AIRMETs appear just like regular AIRMETs in ForeFlight as part of the AIR/SIGMET/CWAs map layer and can be filtered by hazard type. Unlike regular AIRMETs and SIGMETs, G-AIRMETs include a new time slider so you can filter them based on their effective times. One type of G-AIRMET, Freezing Levels, appears as its own layer, using colored lines to indicate where freezing occurs at different altitudes for the contiguous U.S.
ForeFlight Logbook received a few quality-of-life improvements that make searching for logbook entries easier and faster. Search for entries based on comments, flight tasks, or aircraft equipment type in a few seconds. View a person’s details in Logbook > People to see all entries they are associated with, whether they’re a frequent passenger or a CFI. Lastly, creating a new entry with the Add Next Flight button at the bottom of an entry, will automatically carry over any passengers on the previous flight onto the new flight. There are so many ways to customize your ForeFlight experience, and now there’s an easier way to find just the App Setting you are looking for. Go to the More > Settings view and use the “Filter” text box at the top to quickly search and find Settings by name. Our Europe coverage takes another step forward with AIPs for three new countries:; the Netherlands, Denmark, and the Faroe Islands. 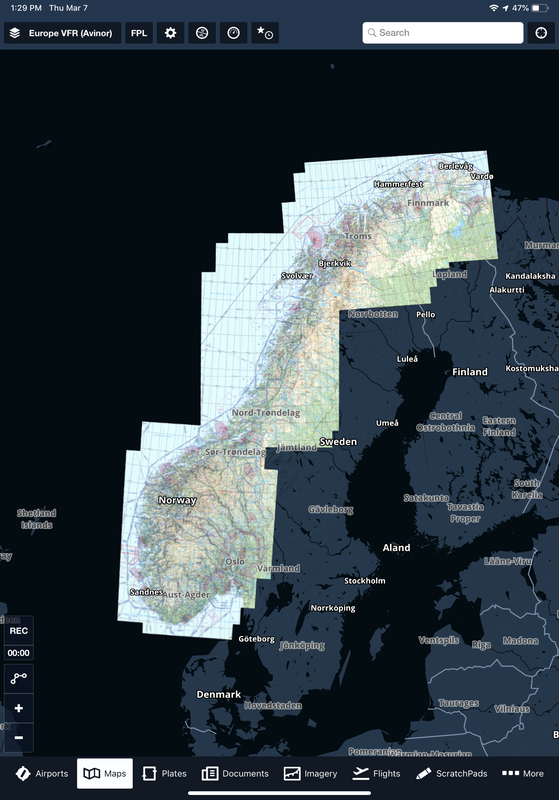 Optional VFR add-ons, such as DFS Visual 500 charts that provide seamless depiction from country to country, and Jeppesen VFR procedure charts are also available for the Netherlands and Denmark. We now support airport diagrams, IFR and VFR procedure charts, VFR ICAO charts, IFR enroute charts, and optional VFR add-ons for 12 European countries! Learn more about our European Chart and Data coverage. ForeFlight now supports importing and displaying KMZ files as Custom Map Layers or in Content Packs. KMZ files are similar to KML files but provide greater flexibility with support for custom icons, bundled KML layers in a single KMZ file, and support rich text formatting within a placemark’s description. Visit our Content Packs support page to learn more about importing custom content. With this cycle we are discontinuing data support for versions of the app prior to ForeFlight 9. Those versions will no longer be able to download the required database. For more information on the supported device please visit the support section on our website. UPDATE February 6, 2019: Compatibility testing between ForeFlight and iOS 12.1.3 is complete and we are issuing the “all-clear” to ForeFlight customers. Feel free to update at your convenience. ORIGINAL POST January 23, 2019: We are performing compatibility testing between ForeFlight and the newly released iOS 12.1.3 to ensure that everything is working smoothly. We will update this post with an “all-clear” when testing is completed. Please also stay tuned to our Facebook page or Twitter feed for updates.